/CZ/ Čestmír Suška is a renowned Czech sculptor, director, and curator. At the beginning of the eighties he organised the cult classic Malostranské Dvorky exhibition, from 1987­1991 he was a member of the artist group Tvrdohlaví, and as of 2000 became a founding member of the Bubec sculptors association in Prague – Řeporyje. 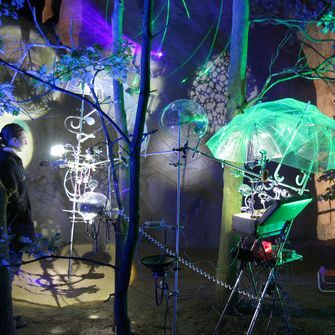 Petr Pufler is an interactive lighting designer. 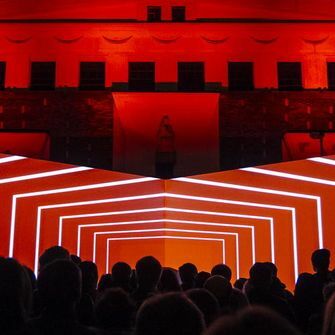 The creator of light installations in music clubs such as Neone, Meetfactory, Bajkazyl, and the café Neustadt, he has also collaborated in addition to the SIGNAL festival with Famufest, the One World festival, Redbull Music Academy, and Lunchmeat. His work has been presented at exhibitions in the Czech Republic and abroad. The matador of Czech sculpture, Čestmír Suška, unites his talents with the young lighting designer Petr Pufler. Suška’s monumental metal cylinder called Ocelot has travelled to Prague from the Restart exhibition in Plzeň to appear in an entirely new context as part of the European Capital City of Culture. 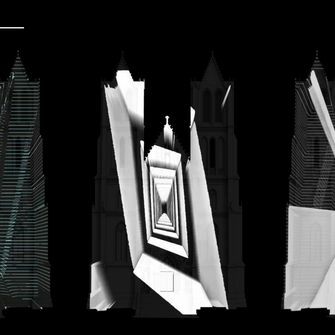 The moving lights of Petr Pufler join this work in a dance of shadows that plays out on the tiles and facades of Ovocný Trh. The installation was lent from the Restart exhibition organized within the project Pilsen 2015.